FEDAGA has secured funding to facilitate a study trip onThursday 28th March to Killandean Community Allotments in Livingston. This will be of interest to anyone on the allotment waiting list who is interested in getting involved in setting up a new allotment site. Community Empowerment legislation requires all Scottish Councils to increase allotment provision to cope with the increasing number of people who would like to have a plot. The waiting time for a plot on an established site in Edinburgh currently varies from 6 or 7 years to well over a decade while the law states no-one should wait for more than 5 years. Edinburgh Council recognises the solution is more sites but chooses not to make this a priority(*), so future plotholders may have to be prepared to set up their own site on land provided by the Council. This event should be a useful first step along the road and will provide an opportunity to speak to some of the people who can help make the project a success. Killandean, which is 5 years old, comprises 35 allotment plots and a community garden. It is the largest allotment site in Livingston. The initial site investigations and planning were covered by West Lothian Council. The actual creation of the allotment site including fencing, paths, sheds, community facilities, rainwater harvesting equipment and composting facilities was made possible by a £100,000 grant from the Climate Challenge Fund. This pioneering site is the template for new allotment sites in Edinburgh. The minibus will leave the City Chambers at noon, returning for 4pm. Contact committee@fedaga.org.uk if you are interested in occupying one of the few remaining seats. Our partnership with Science and Advice for Scottish Agriculture (SASA) continues for a fifth year. We are delighted to announce that SASA will again supply sample varieties from their seed potato store to any FEDAGA members willing to grow them. Three tubers of a named, yet commercially unavailable, variety will be supplied in time for planting. This is usually around the beginning of April. All you have to do is grow them and report back via a short online questionnaire on how you got on and what they tasted like. We'll also try to put on a small display at the Allotment Show in September. It's fun to try a piece of potato history and, who knows, you may discover the tastiest potato you've ever tried. A few people have! If you'd like to take part this year then email -sasatrials@fedaga.org.uk. We're a little late this year so please do it now, or at least before Friday 22nd March with your name and site. This major event appeals greatly to gardening and good food enthusiasts alike. Our excursion last year was a great success. 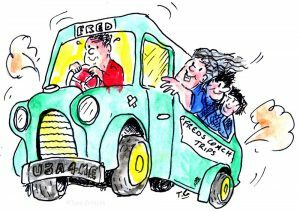 The FEDAGA Committee have kindly offered to subsidise the cost of travel again...... at the same price as last year! A return ticket will cost £6 (non-refundable). Applications can be made in June from a date to be set. A luxury coach has been reserved to take Edinburgh plot holders and their partners/ spouses to the famous Festival. It will leave from and return to the parking place opposite the Apex Hotel, 23–27 Waterloo Place. On this occasion the excursion is open to adults only. The price of entry to the show has not been set: individuals will be responsible for arranging and paying for their own admission and tickets are readily available at the gate. Muriel Horsburgh from Lady Road Allotments has agreed to organise the trip for you again and she will provide more information in the FEDAGA Newsletter as it becomes available. Are you sick of the rubbish composts and growbags from your local DIY shop? Maybe your site association could be thinking of bulk buying for plotholders? If so, you will certainly be interested in using Clydeside Trading Society who have been supplying sites in the West of Scotland for years. They have a very good reputation for both good quality products and service. An example is a professional standard compost: Humax. A 75 litre bag costs £3.39 plus VAT (£4.07). Buy a pallet of 45 for £3.27 a bag (£3.93). As a comparison, B&Q are currently advertising their own brand 'Verve' compost for £4.17 for 50 litres or three bags for £11, that's £5.50 for 75 litres, 35% MORE than Humax. Delivery is free for orders over £200 plus VAT, under £200 delivery is £20 plus VAT (£24). Their price list is available here. Please note - the scheme is designed for site associations. Make your own order up from your site and contact Clydeside directly. FEDAGA are not accepting orders.